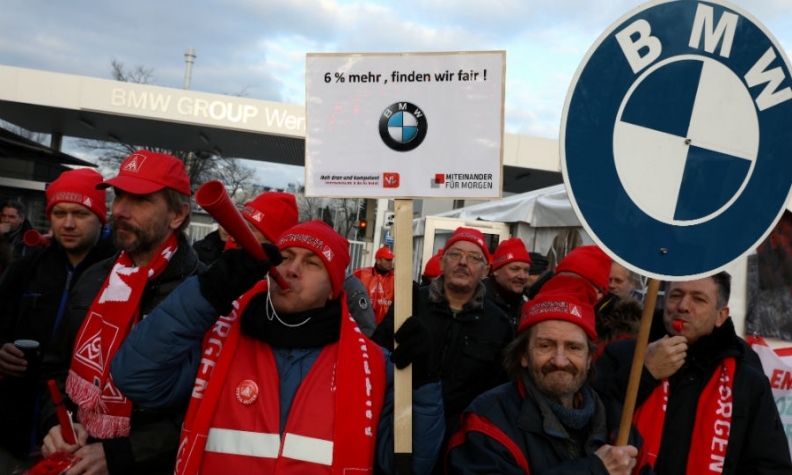 BMW workers during a 24-hour strike by IG Metall. Placard reads "6% more, we find fair." STUTTGART -- German industrial workers and employers in the key state of Baden-Wuerttemberg reached a deal on pay and working hours, setting a benchmark for millions of workers across Europe’s largest economy. The deal averts more disruption at industrial giants from Robert Bosch to Daimler. The agreement between labor union IG Metall and the Suedwestmetall employers’ federation foresees a 4.3 percent raise from April and other payments spread over 27 months. “Workers will have more money in their pockets in real terms; they will get a fair share of company profits; and that will boost consumption,” IG Metall negotiator Roman Zitzelsberger told reporters after talks in Stuttgart on Monday that lasted 13 hours. IG Metall had asked for a 6 percent annual raise for 3.9 million workers against a backdrop of a strong economic recovery and the lowest unemployment since German unification in 1990. "The deal isn't extremely good for unions, but it isn't too bad either -- overall they managed to push through more of their demands than expected," said Andreas Scheuerle, economist at Dekabank in Frankfurt. "If you add the one-off payments and narrow it down to wage growth over one year, that leaves you at about 3.8 percent." The deal covers half a million employees employed in southwestern Germany, home to Bosch and Daimler. Both sides said they will recommend its adoption across the country. For employers, the challenge was to meet the union's demand for more free time while already suffering from a shortage of skilled workers in some areas. Suedwestmetall negotiator Stefan Wolf said the size of the award had been tough for employers to accept. Yet he welcomed the deal’s long duration, which he said would enable companies to plan ahead. IG Metall had staged a series of 24-hour strikes and threatened to ballot its members for extended industrial action if employers failed to offer concessions following the walkouts at Monday’s sixth round of pay talks. Last week’s strikes cost carmakers, automotive suppliers and engineering firms almost 200 million euros ($249 million) in lost revenues, affecting companies such as Daimler, BMW and suppliers. As is often the case in Germany’s highly ritualized system of wage bargaining, the details of the deal were highly complex. At the end of the day, said Suedwestmetall negotiator Wolf, the cost to employers would work out at below 4 percent per year. In addition to April’s 4.3 percent pay rise, employees will receive a one-off payment of 100 euros ($124) extra for the first quarter. From 2019, workers will get an additional fixed annual sum of 400 euros as well as a payment equivalent to 27.5 percent of their monthly pay. Workers will also be able to reduce their working week to 28 hours from the standard 35 to care for children, or for sick or elderly relatives, for a period of up to two years. In return, employers will be able to take on more staff willing to work for up to 40 hours -- creating the flexibility they need to ramp up production during periods of high demand. "In the broader European context, the fact that this wage settlement was agreed for a period of 27 months underlines that it is not the start of an upward wage-price spiral in Germany," said Carsten Brzeski, chief economist at ING-Diba in Frankfurt. "In fact, spreading a 4.3 percent nominal increase over more than two years would actually create less not more upward pressure on wages compared with recent years."